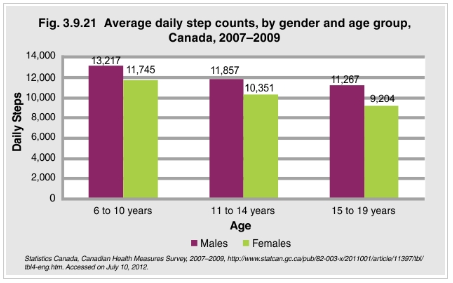 According to the 2007–2009 Canadian Health Measures Survey, younger boys and girls are more likely to be physically active – as measured by average daily step counts – than are teenagers. At all ages, boys are more likely to be physically active than are girls. The average daily step count declined by 15% among boys from the ages of 6 to 10 years to the teen years. The decline for girls was about 22%. According to the Report Card on Physical Activity for Children and Youth, only 7% of children and youth are meeting the Canadian guidelines of 60 minutes of physical activity per day1. 1 Canadian Health Measures Survey (2007–2009). Statistics Canada.